In the Conference issue of Information Outlook (otherwise known as Issue 4 of Volume 13), Stephen Abram focuses his column on blogging tips for special librarians. Useful if you're new at it, a good refresher if you're an old-hand. Very interesting article in the Wall Street Journal today April 21st, by Mark Penn and E. Kinney Zalesne: "there are almost as many people in the US making their living by being bloggers that there are lawyers." The best studies we can find say we are a nation of over 20 million bloggers, with 1.7 million profiting from the work ,and 452,000 of those using blogging as their primary source of income. That's almost 2 million Americans getting paid by the word, the post, or the click -- whether on their site or someone else's. I don't think a great number of them are librarians or information pros though. Part of Cites and Insights 9:3, February 2009, Walt Crawford put in article form the presentation he did at the Ontario Library Association Superconference; it's entitled Shiny Toys or Useful Tools? After a few general definitions and tips (for novices? ), Crawford gets to the meat of the presentation: how library blogs have moved from the "toy" phase to the "tool" phase; in other words, how they have matured. He uses two threshold, "robust" and "active" to then analyze the academic library blogosphere and the public library blogosphere. Ada Lovelace (born in 1815) could have been known as the only legitimate offspring of Lord Byron, but instead decided to also write some computer code for Babbage's analytical machine (read: early computer) and hence is generally recognized as one of the first computer programmers. She walks in beauty, like the 1001110 1001001 1000111 1001000 1010100. On March 24, 2009, pledge to write a blog post about another woman in technology who rocks your socks, and shine a spotlight on someone who might not be getting the kudos she deserves. Steven Bell posted some musings about biblioblogosphere stardom on the ACRL blog. Niche market and steady content are the main conditions to become a blogging star, according to him. The ASAE and The Center for Association Leadership has a e-magazine called Associations Now. A recent article suggests strategies and solutions for an association blog that may not get as many comments as desired (thankfully our faithful readers here comment regularly). A lot of the content applies just as well to private blogs. Oh...do we all follow all of the tips we read? No, and that's what makes each blog very unique! If you are interested in knowing what SLA is doing is Second Life, you can check out the workgroup's wiki or read the blog. If you add the blog to your blog/RSS reader, you'll easily receive updates from the workgroup. 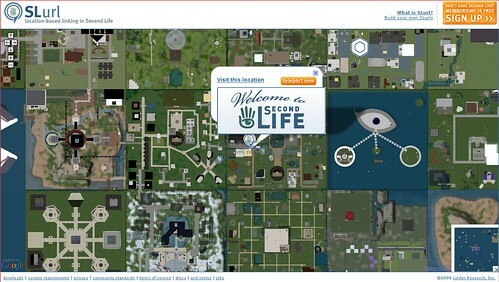 Interested in visiting the SLA land in Second Life, here are directions for finding us! I don't know if we've mentioned the OPL Plus blog on here before - but I find that it often has great posts that not only apply to One Person Libraries - but special libraries. This week's post was a list of five most notable legal sites. This is certainly a blog to add to your reader as a special librarian. If you would like to receive updates of this blog by email, you can now use the new Feedblitz tool to register your email address. Just look at the top of the right-hand column.